Jerry Jones grew up southwest of Tulsa, in the “Creek Nation” town of Sapulpa in Indian Territory before it became the state of Oklahoma in 1907. Few details of his personal life are known at this time other than he played football at Notre Dame University in 1915 [along with future Staley teammate Emmett Keefe] and again there in 1916. In 1917 he attended at least one semester as a “Special” student at what was then known as Dubuque College [later Columbia, and now Loras] in Dubuque, Iowa and worked part-time in a munitions factory. Jerry Jones started at left guard in all 13 of the 1920 Staley games and often kicked off. When the season was finished, he took his player bonus and headed back to Sapulpa. In 1922 he played for the much hated Rock Island Independents along with old pal Emmett Keefe for ex-Staley teammate and now player-coach Jimmy Conzelman. The newly christened Chicago Bears beat them both home and away that season. 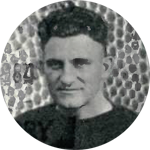 In 1923 Jones played in all of the games for the NFL Toledo Maroons. His last pro season was with the Cleveland Bulldogs, this time being coached by former Staley teammate Guy Chamberlin. The Bulldogs were NFL champs that year with their only loss coming in Chicago at the hands of the Bears. Jones later lived in Tulsa and became a coach. He died at the age of 42 and was buried in South Heights Cemetery, Sapulpa, Oklahoma.